You must be active in helping your young group to follow our facility rules (clearly posted and explained at the start of the party). Your UPTOWN party hosts will be focused on their priority of getting little climbers UP AND DOWN our walls. We ask that parents/chaperones please maintain a minimum ratio of one parent/adult per five kids. Small Party $275 – Ages 7 and Up. 2 hours and Up to 10 kids (or adults if you want!). $15 for each additional attendee up to 15 max. 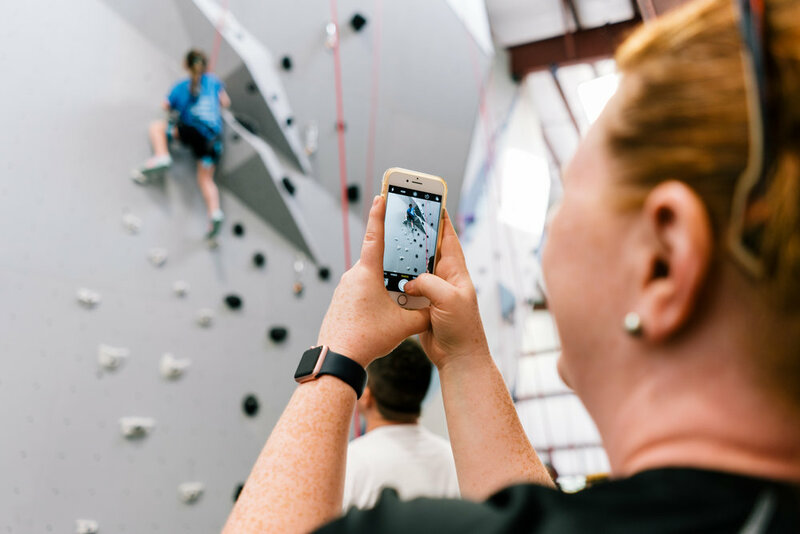 You get two 45-minute staff-assisted(about 1 staff/5 kids) climbing sessions with a 30-minute party break in the middle (plus the party room for the duration). paper goods (plates, cups, plastic ware). Reservations Required. Book online via our Party Calendar. Please visit our Party FAQs to see if we've already answered your questions. Large Party $450 – Ages 7 and Up. 2 hours and Up to 20 participants. $20 for each additional attendee up to 30 max. You get staff-assisted belay for the full two hours (about 1 staff/5 adults). Includes large room rental, climbing harnesses, and paper goods (plates, cups, plastic ware). We can customize to meet your needs. Please visit our Party FAQs to see if we've already answered your questions.. This option is perfect for businesses, churches, schools, and other large groups looking for a day to work and play. Reserve the full gym, weekdays only, between 8am & 2:00pm. Hold your meeting, have your lunch, celebrate your success. Work hard then climb hard. We’ll provide staff to train your team or belay them. When the gym opens at 2:30pm, your team can continue to climb our boulder and auto-belays the rest of the day.